The first time New Zealand inventor Kevin Halsall stepped on a Segway, he saw the potential of using the technology to build a wheelchair that could be controlled without a joystick or requiring the rider to use their hands at all. So he bought one, stripped it down, and turned it into the Ogo. 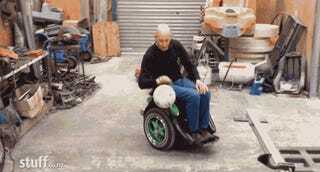 Because the Ogo wheelchair started off as a $14,000 Segway, it’s the only prototype in existence. But Halsall has been able to refine its design to the point where he’s confident that with a few more small tweaks, it’s ready to be commercialized. The Segway is controlled by the rider leaning forwards and back while steering with a pair of handlebars in hand. But the Ogo requires a little more finesse, and Halsall has tweaked the electronics to be more responsive to movements from the rider’s core muscles. Leaning forward and back still propels it in those same directions, but side-to-side movements are also now taken into account for steering. There’s no word on how much the Ogo could cost, but it’s assumed that every single unit will start with an actual Segway so the price tag will be even more than those self-balancing toys. But with an average range of around 18 miles on a single charge, it could be used all day long giving those who rely on a wheelchair a considerable boost in mobility and freedom.